In this challenging real estate market, the proper presentation of listings has become increasingly more important. With 88% of home shoppers turning to the Internet before they pickup the phone it is now more important than ever to increase your reach online and deliver a lasting impression. Please allow us to introduce ourselves on behalf of Water's Edge Virtual Tours, Northern Florida’s property marketing experts. Whether you are a listing agent or an owner of a local business large or small our services are just what you need to turn heads and make you look your very best. Our wide variety of services include state of the art interactive 360 virtual tours, professional photography services, powerful slideshow presentations, interactive 2d and 3d floor plan services, colorful and vibrant listing flyers, panoramic sign riders, single property websites, listing syndication services, and so much more! Our virtual tour exposure engine is currently something that no other virtual tour company in northern Florida offers. We distribute real estate listings and virtual tours to over 100 portal sites world wide. Listing syndication just makes sense. You know that when you generate more exposure for your listings, they are likely to sell faster and for more money. If you are a real estate agent or a business owner we can also show you how to make your website receive more traffic. 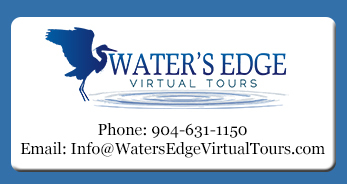 Water's Edge Virtual Tours is located in Northeast Florida, where we are pleased to provide a wide range of services to meet all your Virtual Tour needs. Click for a sample of the many features available within a Water's Edge Virtual Tour.